The 4 pint rapid feeder is simple and easy to use. The feeder sits directly over the central hole on the crownboard, leaving the other hole open for ventilation. 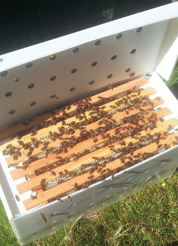 It can be refilled whilst still on the hive to minimise disturbance to your bees. The feeder fits nicely under a deep roof without the use of an eke. If you have a shallow roof, or a gabled roof, you may need to put on an empty super on to raise the roof to give space for the feeder.